I have been planning to go to the Hajj Exhibition since it opened. But circumstances beyond my control prevented me from attending until now. I managed to convince hubby to take a day off work today and off we went. Please forgive the lack of pictures but sadly you are not allowed to take pictures in the actual exhibition. Although some people were clearly ignoring the rules, I preferred to respect the museums wishes. I managed to take some around the museum itself, but had to use the iPhone, as in the rush to leave in the morning, I forgot to take my actual camera! So sorry about the quality! 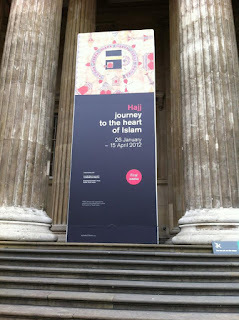 You simply cannot miss the fact that the museum are holding a hajj exhibition. The banner above was right at the front of the entrance. Before you enter be prepared for your handbags to be searched. However, it is more like a quick glance. You then enter the darkened exhibition to the sounds of the Azaan (call to prayer) mashAllah. This really added to the atmosphere and prepared you for the rest of the exhibition. Munchkin started whispering and asking if we were allowed to talk! Before the full main exhibition starts, there is a full length door covering of the Kaaba on display. Oh how I wish I could have taken a picture of it. It was absolutely beautiful and one of my favourite items on display. The exhibition itself is in stages. You are first introduced to the hajj, the reasons for hajj and also a bit about the pilgrims – the clothes they have to wear etc. You are also shown how pilgrims used to struggle to get to the hajj – it is awe inspiring the efforts that they had to go through to go.You are then show various items, including a video, about Mecca and the hajj. And finally you are shown information about pilgrims returning. I was quite impressed by the video. It is extracts from ‘Journey to Mecca’ which sums up the hajj in a clear concise way. It wasn’t too long and kept everyone’s interest. I had a quick glance around and everyone was engrossed in the video, even the young children. One of my other favourite items was a covering of the Prophet’s (SAW) grave. I was surprised to see that and it is one of the items I spent longer looking at and taking it in. Again I wish I could show you. There were a few items there that I wasn’t expecting. I saw what is reported to be Tipu Sultan’s headgear for war, which was said to be dipped in Zamzan water leading to it being impenetrable. 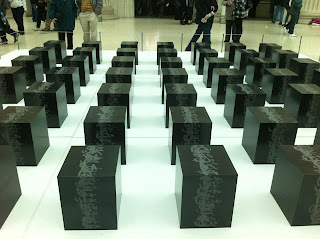 I was amazed at the amount of non-muslims that were at the exhibition. I guess I was thinking that non-muslims would not be bothered, considering the hatred that seems to be out there for Muslims at the moment. However I was so pleased to see that they genuinely seemed interested and wanted to learn about the beauty of Islam and the hajj. 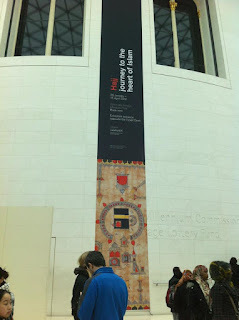 I heard one lady at the start of the exhibition ask a Muslim man if women were allowed to attend and be near the Kaaba. That did make me smile as there does appear to a common misconception that the women are not allowed to do anything and have to just stay at home, but I was glad she was asking and wanted to learn. The exhibition is only running until the 15th of April. So if you are planning to attend then don’t delay! If you would like further information about the hajj you can see my post here. Disclaimer: I was sent a complimentary ticket to attend the exhibition. However, I was not asked to write this review and all opinions are my own. So glad through read through lines. Badly wishing to go for Hajj in near future InshaAllah! Exhibitions like these are so informative and interesting. We get to see and learn a lot. Such events always interests me. Unfortunately I can't visit but nonetheless I gained some knowledge reading this post. 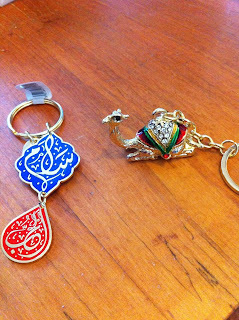 That camel key chain is so cute. This is a very beautiful sharing, Foz. It's good that the British museum is holding such an exhibition so that more people can get a better understanding of Islam. In some books that I read, they always mention about all the religions, except Islam. As though it doesn't exist! That is part of the reason why Islam is least known by the west and people will fear what they don't know. I wish more such exhibitions about Islam will be displayed in the future by the west. Too bad I'm not living close to it. Mashaallah sounds like a great experience.. Like the stuff you bought.. How I wish they did some events in the museum about Hajj here..
InshAllah we will all get to go soon! I agree it is good of the museum to hold this exhibition and to portray Islam in such a positive light.